My Wendy’s Chili Recipe is a copycat version from the popular Wendy’s restaurants, giving you the perfect flavor for a classic chili. It didn’t start out as the perfect chili recipe, it sort of evolved over the course of 20 or so years. 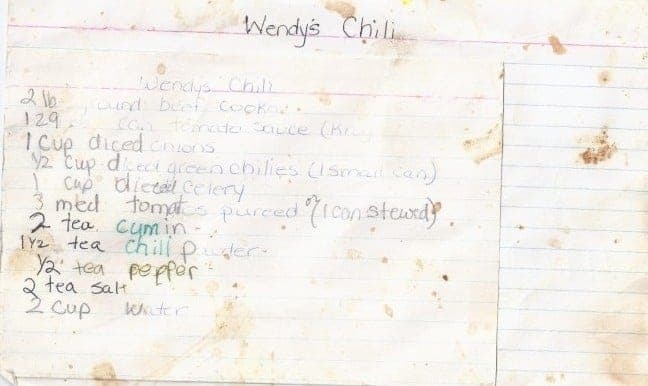 You can tell by our recipe card it has seen many a pots of chili made with it. It’s a classic that I can make as is or kick it up by adding different beans or hotter spices. 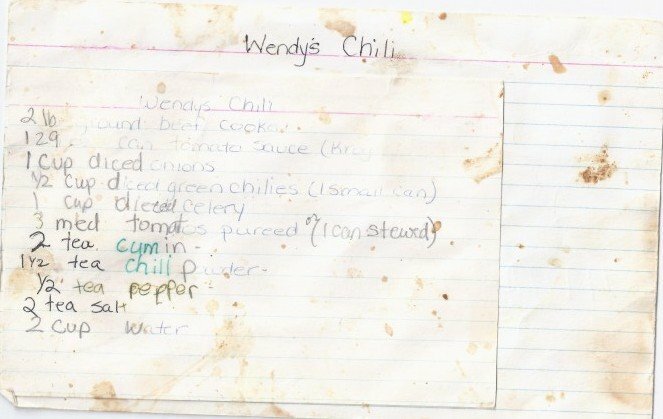 This Wendy’s Chili Recipe started out when I checked out a copy cat recipe book from the library when we were first married. It was supposed to taste just like Wendy’s Chili. I wrote it down on the small index card minus the beans the original recipe called for. At that time we did not appreciate the goodness that beans can add to a classic pot of chili. Over time we made a few changes like using stewed tomatoes and canned green chilis. Also, as it evolved we realized we liked topping our chili with finely shredded cheddar cheese, onions, sour cream, chopped jalapeños and our newest favorite Tomatillo Avocado Salad Dressing instead of sour cream. Sounds like a great chili recipe. I make a vegetable chili I make where I add in hominy, black beans, chopped red pepper and diced squash. I like to make a big batch and freeze it in small containers for quick lunches. Hope your family has a Happy Thanksgiving.